The standard processing time for a new or renewal passport or visa is six to eight weeks. This time can be extended dramatically during the peak travel seasons, like during the warm summer months or around the holiday season. 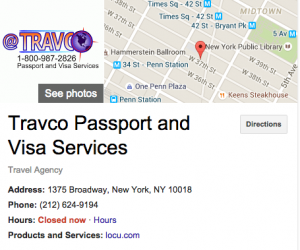 If you’ve got a big trip coming up that you can’t afford to miss, you can trust Travco Passport with all of your passport and visa processing needs. They’ll submit all of the necessary documents on your behalf and will return to you with a new or renewed passport or visa in as little as 24 to 48 hours depending on a few different factors, like where in the country that you live. You don’t have to worry about needing and not having the right paperwork again.